Surface 2 will be Surface RT number 2. Got it? Yep, we thought Windows RT was probably dead, too. , dropping any mention of RT. 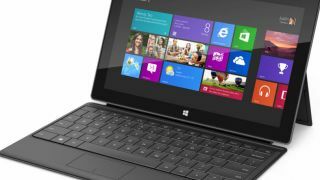 Despite the original Surface's problems, we knew that Microsoft would sell a second version of the tablet. You might think this is a bad idea but hey, this is a company that just splurged several million euros on Nokia's mobile phone business. The clues about the Surface 2 come from Dutch site TabletGuide.nl, which discoved the information in the GFXbench database. The interesting stuff? Surface 2 is running Nvidia Tegra 4 which should mean a decent performance improvement over the preceding Tegra 3. But the performance signs aren't good. The Surface 2's score on the 3D GFXbench test is 573 frames, which isn't great compared to various Android tablets which score several hundred frames more. And further bad news surrounds the display spec. While the Surface Pro had a 1080p Full HD resolution, the Surface 2 appears to be sticking with the Surface RT's 1,366 x 768 pixel resolution.